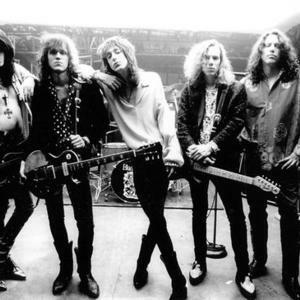 The Black Crowes are a blues-oriented hard rock jam band formed 1989 in Atlanta, Georgia, United States that has sold over 15 million albums and were hailed by Melody Maker as "The Most Rock N' Roll Rock N' Roll Band In The World" The band has toured with acts such as Aerosmith, ZZ Top, Jimmy Page, Tom Petty and The Heartbreakers, Oasis and Lenny Kravitz. The Crowes are listed at #92 on VH1's "100 Greatest Artists of hard rock". Three Snakes & One Charm, the group's fourth album, was released in July of 1996. The album entered the charts at number 15, but it quickly slipped out of the Top 50. Nevertheless, the album received the best reviews of any Crowes album since The Southern Harmony and Musical Companion. Guitarist Marc Ford was fired from the Black Crowes in August, 1997; two years later, the group returned with By Your Side. In mid-2000, the band collaborated with Led Zeppelin guitarist Jimmy Page on the double-disc Live at the Greek, an eclectic mix of newly recorded Zeppelin covers and additional classic blues cuts. A Tribute to a Work in Progress: Greatest Hits 1990-1999, a 16-track best-of compilation was also released in mid-2000. The Don Was-produced Lions appeared in spring 2001, and a summer tour with Oasis -- the Tour of Brotherly Love -- followed in June. But all was apparently not well with the group, in January of 2002 the band announced that they were on hiatus. Drummer Steve Gorman was fired from the band, and Chris Robinson announced his intentions for a solo career.